After seven years of use, recommend this product unreservedly. (23/10/2017) Amendment to original review from 2012. We love our Steripen. We have continued to use it for several weeks of backpacking every year since 2012 and have never had a repeat of the problem mentioned below, so I'm not really sure what happened back there. I am almost wondering if it was user error. If you push the button and then immediately submerge the bulb into the water the light will flash red and the Steripen will not work. You need to wait for the light to begin flashing green before submerging it. Is it possible that I forgot this, back in 2012? Very possible. On longer backpacking trips, nowadays, we carry Aquamira as well as the Steripen. We do this so that we can carry fewer Steripen batteries; the Lithium batteries are expensive. But we only used Aquamira-treated water for cooking, making coffee, and washing out cups etc—the water treated with Steripen is pure and tastes of the mountains so we prefer it for our straight drinking water. It is wonderful to be able to scoop water from a stream, poke the Steripen into it for a few minutes, then drink straight away. No energetic pumping, no chemicals, no waiting. 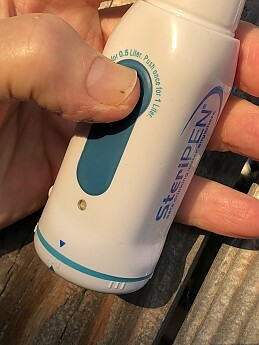 On a recent ten-day backpacking trip we used the same set of four lithium batteries in the Steripen for the whole trip, treating most of our drinking water for two people, which we thought was pretty great! ometimes we don't carry this setup, and just use 500ml Nalgenes and collect water from the stream in a bladder. We then pour it through a fine cloth to remove debris. But we are always dealing with clear mountain stream water. The Steripen works fine in the 500ml bottle and has a setting for this. So I don't disagree with my original comments below, but just wanted to note that we have simply not had this problem again, and based on our experiences from 2013 to 2017, I would recommend the Steripen unreservedly. 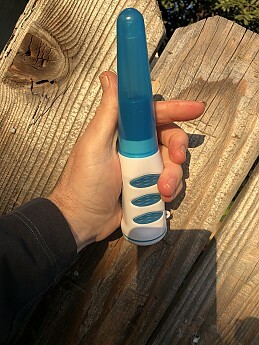 We have had our Steripen for two years and generally we think it is great — but I must say we haven't used anything else really, as we have only hiked in the mountains where the water is usually clear and pure. I didn't want the physical exertion of a pump. (Lazy!) When we did need to use lake water that was a bit gunky with algae and such, we had issues with the gravity fed prefilter clogging. So wouldn't recommend it for this type of water. On recent 21 day backpacking trip in the Sierra Nevada as usual Steripen was mostly fine. However, it did need the top-of-the-line expensive four AA Lithium batteries replaced every four days (for two people) and we had some trouble with it on day 20 of the trip. 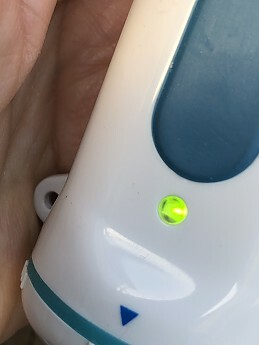 The light went red (instead of flashing green) when we pushed the button, as it does to indicate flat batteries, but even with new batteries, it would not work. Regarding the battery consumption, which seemed pretty high, I also discovered that the batteries which were "too flat" to power Steripen would power other appliances, such as my camera, for absolutely ages. So probably Steripen is best used for shortish trips and in conjunction with rechargeable batteries, to avoid this wastage. Any piece of equipment can fail. We will try our Steripen again on a shorter trip. But we always carry backup tablets. I use NiMH batteries with mine and have not had any problems. 21 days of steady treatment would require recharging a few times. thanks for the review! Thanks for the helpful update, Donna! My SteriPen Classic has been, overall, a pretty handy little device. Remember that it is only for certain circumstances — it's not good for treating water that's not already fairly clear or may contain other contaminants like pollution, pesticides/fertilizers used in agriculture, and so on. So think about the water at your destination before you take the plunge. 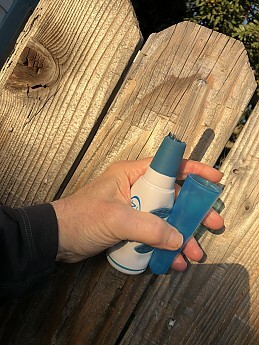 That said, if you're looking for an easy way to treat high mountain streams or lakes -- water that's not likely contaminated with other particulates -- then the SteriPen is very, very handy. Mine has been a trooper, reliable and with plenty of battery life. I use those Lithium disposable batteries (my rechargeable ones haven't worked well at all with this unit), and one set (4) has treated several dozen liters of water with no trouble. Carry an extra set (they're very light batteries) and you'll be set. This would also be an excellent addition to your luggage when traveling in places where the tap water cannot be trusted, though I have not used it for this purpose. And, as other reviewers have mentioned, if you think you'll need to treat anything other than mountain streams, lakes, or foreign tap water, opt for another system. Think of the SteriPen as a sort of modern approach to boiling water -- if you wouldn't want to drink the water after just boiling it, then you won't want to drink it after zapping it with the SteriPen. My set came with a cap and pre-filter that fits Nalgene bottles. I would highly recommend getting one of these, as it solves both the particulate problem with a little filter and the contaminated threads problem. Screw it on the top of your bottle and it covers all the threads; remove the little pre-filter after filling and the SteriPen fits snugly right into its place so the Pen is mounted to the bottle, so to speak, and you don't have to hold it while it does its thing. Makes for a complete and very handy overall system. I have had one reliability incident with my SteriPen. My hands were just barely wet when I went to replace the batteries (stupid rechargeables, failed me again!!! ), so the Pen got a little wet in the battery compartment and kept giving me a dreaded red light for the rest of that trip. So I packed it away, planning to send it back when I got home. But once I was back to civilization it worked again, and hasn't had a single problem through four other backcountry adventures. So you do need to be a little careful with your SteriPen, and always bring tablets as a backup. I would also recommend carrying a little packtowel or something else to dry off the unit in case it gets wet. And if it stops working, open it up and let it air out. But that caveat aside, it makes for a fantastic and very, very easy way to make fresh water after hiking through the backcountry. If I'm going high in the mountains where I know the water isn't subject to pesticides or other sources of nasty pollution, I leave my filter at home and just bring the SteriPen (and some tablets, of course). No pumping, very little waiting, and no hot drinking water. Overall, very awesome. The Steripen is dead weight on a backpacking trip. I used it successfully for 3 days, and the lamp stopped working. I returned it, which was supposed to take 2-3 days, and it was gone for 2 weeks. 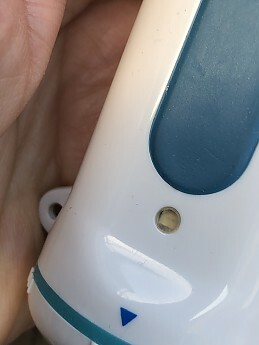 When I received it, it worked at home, but on the first day of my next trip, it only purified 3 quarts, with brand new lithium batteries, (which they recommend), before failing. I tried 5 or 6 times to get it to work, following the manual, with no luck. I then replaced the batteries with fully charged NiMH batteries. It purified one quart, and failed again. I tried with brand new duracells, with no luck. Luckily I carry iodine tablets as a backup. Without them I would have been out of luck. I spend 25-30 days a year backpacking. My old filter is a far more reliable and quicker way to purify water in the back country. Have used mine for the last two years and haven't gotten sick once. Good points are that it's smaller than most water filters and as far as I know is completely effective against all waterborne bugs. Easy and quick to use. Water is without chemical taste (though since it isn't filtered, it will retain the taste of the stream or pond it comes from). Reasonably lightweight, though far heavier than say, MicroPur tabs. Bad points. Expensive to buy. Annoying child-safety button pushing code to operate. More important, the lamp loses effectiveness after 625 gallons and must be replaced, and the lamp makes up most of the cost of the unit. Add in the cost of 4 AA batteries that must be replaced regularly and it is the most expensive of all backcountry water treatment solutions. UV light, unlike chem treatment, has no continuous effect to prevent regrowth of bacteria, and so UV water must be consumed reasonably quickly or else re-treated. Fragile. Can break if dropped on something hard. Replace the protective tip and place in case immediately after use. Finally, since UV treatment does not work as well on turbid water, and since sediment-filled water can make you sick (diarrhea) as well, you will need some method (sock/sand, coffee filter) of straining turbid/muddy water or else wait for it to settle out. Price Paid: about $80 back then. i remember it was on sale. SteriPEN is an excellent handy tool for the right applications. also in a restaurant in a cup of water, and in many water bottles, one can turn the bottle upside down, with the pen acting as a plug, while doing sterilization. sterilize, and not to forget that. 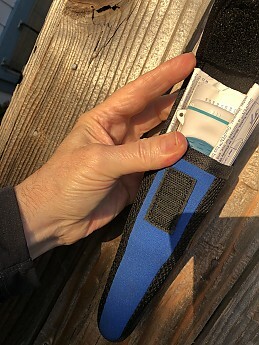 strap, and can be used when out camping, but also in a restaurant in a cup of water, and in many water bottles, one can turn the bottle upside down, with the pen acting as a plug, while doing sterilization. It appears to have been developed for military application, to my memory, and that's a pretty good recommendation as to efficacy. It's quick and easy to use. Others mention that one should use lithium batteries, and I'm glad I read those reviews. However, although I do NOT recommend this, I had regular old batteries, not lithium, in my steriPEN for years and had no problem. Again, that's just anecdotal, not proof one should fail to use proper batteries. The device seems very solid, streamlined, easy to store. I bought it in 2008 when I was preparing to immigrate to the wondrous town of Ciudad Guanajuato, in the state of Guanajuato in Central Mexico. Since my gastro-intestinal system is used to, or immune to, normal flora in my area, (Calif. USA), but not necessarily in Central Mexico I thought it was a good idea. People in Mexico, or at least that well known famous, (yet has almost zero gringos, even as tourists), city of Guanajuato, do not drink the water in their pipes or plumbing. They buy drinking water that has been purified. I also noticed when I moved to Los Angeles, most people buying water, that I first saw, were Latino families, and I believe first or second generation immigrants. So they had no great trust of Los Angeles water, either. Anyway, I've owned my steriPEN classic for 11 years and it still works great. TRIVIA: I think in the Canadian Sci-Fi Series "CONTINUUM" (I saw it in the U.S.A. on Netflix or Amazon), there is a scene where this young man pulls out this futuristic device to do some sort of test or to somehow affect something. (not a water sterilization, but some exotic futuristic thing). I was delightfully amused that they chose to use a steriPEN just like mine, as the exotic-futuristic-mysterious device! Kinda ruined the scene, (because it was supposed to be some cosmic device... to my memory that is), but was fun! I cannot compare to other products as I've never had others. This original Classic model doesn't come with a filtration, just sterilization, mode, worth noting. Also, READ THE INSTRUCTION BEFORE you go out into the field. The operation and understanding of the warning or success lights is better understood when practicing at home, not in the field. The comprehensive multi-language, instruction book in my model, fits in the case, giving more buffer to protect the unit (although one would want to have a backup photocopy). I've only used the unit maybe 25 or 30 times in the last 11 years, so I cannot attest to thousands of uses, etc. That's a funny bit of trivia, Rory! I'm always curious to notice what gear people are using in movies and TV, but this goes beyond checking out a jacket or pack brand. Thanks for the review! I've had multiple ways to filter water. I've use drops, tablets, pumps, and used gravity. I've settled on the SteriPEN UV filtration system. I love the ease of use. I simply fill a Nalgene, turn on the light source, and in about 90 seconds I have drinkable water. It includes a pre-filter to keep floaties out. SteriPEN, like most filters, keeps out over 99% of most of the things that can make you sick. It comes with a pre-filter, but if the water is really dirty, I also use a clean bandanna. The UV light is good for about 8000 liters of filtered water. It only weighs about 3.5 ounces with the batteries. 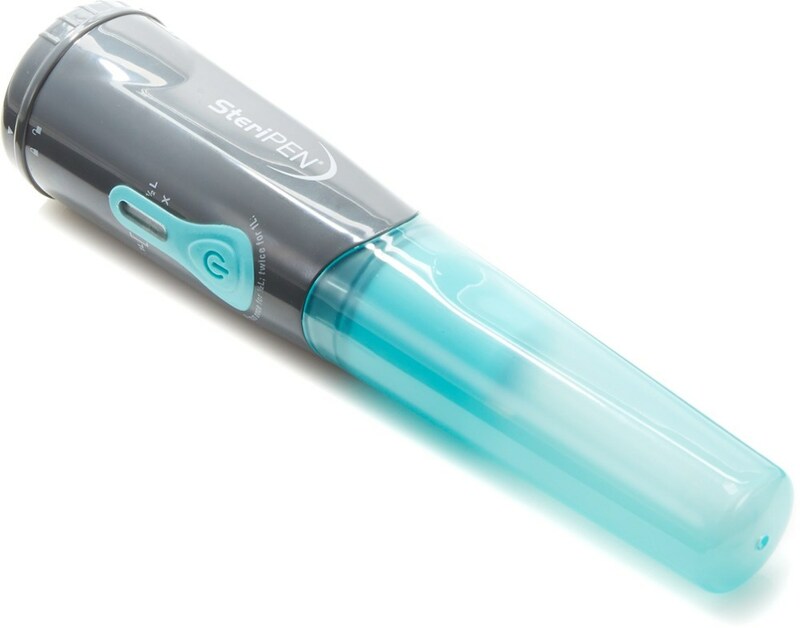 When using a SteriPEN click a button to activate the light, and you can either swirl the water or swirl the light. It takes about 90 seconds to drinkable water. It is great for solo hikers, or a small group, I recently was a part of a 8 person group and was the last to begin filtering and the first to have treated water. Everyone else in the group was using a pump style filter. I usually hike in 8-9 day increments and the batteries have always lasted. If you needed an emergency light, you could use it for that. The only issue I've had with the SteriPEN was on a trip thru the Smokies when it was really cold and snowing. I found it best to keep the batteries in a pocket inside my jacket. I've used my SteriPEN for a couple of seasons. It has held up well. Welcome to Trailspace, Donnie! Thanks for your SteriPEN review. Works great, until it fails on you. I have had my Classic for one season, that's it! It worked on my first couple of overnighters of the spring, and then the indicator light went out. The problem is that humans cannot see UV light, so you have no way of knowing if your water is getting purified if the indicator light is off. I sent it back, and they repaired it. Nevertheless, I wouldn't waste your money. I have read numerous other complaints about this product, and I will probably just buy a Hiker Pro filter next year. Live and learn! If you get one, make sure you have plenty of drops/tablets as backup (which you should have, anyway). Best device for the money. Had it for four years now and it's never failed me. Even when I dropped it and the battery cover cracked, it still worked. Great piece of kit, never go off into unsafe waters without one. I've had the Steripen Classic for four years now and it's never failed me. Even when I dropped it and the battery cover cracked, it still worked. To boot, when I called SteriPEN for information on how to repair the cracked cover they simply shipped a replacement battery cover to me -- at no charge. In short this is a great piece of kit, never go off into unsafe waters without one. I got this three summers ago after going on a backpacking trip with a buddy who had one. I really like the convenience and the quickness on how it works. Here in CO most of the mountain streams we come across run clear so we are not dealing with murky, dirty water. The included filter works well to block the bigger stuff. I've put three years of use on the Classic model and to date, have had zero issues with it. I buy the lithium ion batteries for it and the last set made it through the complete summer. I do carry a spare set so there is the added battery weight to contend with. So far I've only used it in mountain streams and creeks where the water is pretty clear. It's really nice to be able to quickly fill a water bottle and purify it within a minute or two. There have been plenty of times where we ran out of water on some long hike and this device worked like a champ to get us filled up and hydrated. My buddy has had his for over five years and has yet to have any problems with it so the durability appears to be good. 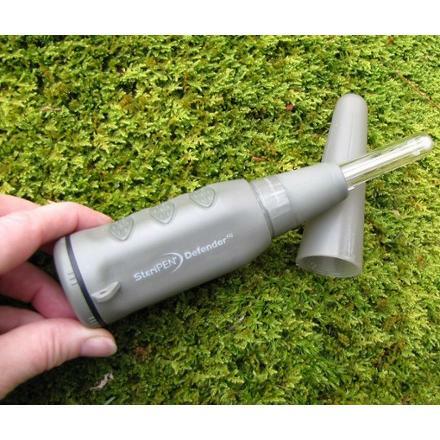 If I lived in an area where the water quality is more suspect and/or the water is dirtier I might think about getting a different type filter, but for where I camp/hike this is a great tool for us. I definitely recommend it. The easiest way to be safe when using unknown water is the SteriPEN! It weighs next to nothing. Was a little worried about the glass tube. Didn't break but it seems like an easy part to break. Some friends and myself took a backpacking trip into Denali National Park. Specifically we hiked up the Toklat River crossed the ridge to the west and then returned through what was essentially a swamp. We knew water was going to be a factor on the trip. We had planned on 3 days in and 3 days out with 1 extra day for what ever... So, 7-day trip in the backcountry. The main source of water for the first half was the river. A glacier melt river so it was packed with tons of silt. We did the best we could with out micro filters but considering the abuse they were getting from the silt. We also used a SteriPEN on everything. The best part about the SteriPEN is its ease of use and the re-assuredness we all got after 5 days of abusing the MSR filter that regardless of the condition of the micro filter nothing was going to make us sick from that water. So, in a nut shell I wouldn't give up a filter or pre-filter before using the SteriPEN. However, I will from now on always have a SteriPEN with me in the backcountry... NO MORE SICKNESS DUE TO BAD WATER!!! I like it. It's not the end all be all of water purification, but I use it and like it. None, it works as designed. Sometimes if the water is really dirty, I use my MSR Miniworks then hit it with the Steripen. But, as a backup I keep a small bottle of iodine tablets in my backpack because mechanical things do fail sometimes. We used this product in Kenya for a group of 14 people for 10 days. Never heard of it until one of our guys pulled it out, so we also used chlorine. I think for colder lake and stream sources (Lake Superior, Rockies, etc), I'd consider using this product again. But for most situations that involve warmer, cloudier waters, I'd rather use some filter that removes particulates and associated tastes and odors. We used my MSR Waterworks to filter water from an open well that had a "sweat" taste for a team of 7 people for two weeks in Romania; the filter removed quite a bit of a solid yellow substance we couldn't identify. The Steripen wouldn't have done that. I still love the reliability and longevity of the MSR ceramic filters(Waterworks/Miniworks). I might consider using the Steripen abroad to remove viruses after using my MSR to remove particulates and taste. But probably not alone outside of the high country. Wonderful device, I love not having to pump water. Wonderful device, I love not having to pump water. Everyone in my hiking circle now uses one of these with very few problems. I used it for 1 week straight and I was with 10 people we all drank about a gallon a day and the batterys (Energiser-lithium) only died once. I found it good and fast. We didn't really need it even though we were getting the water from a stream the rangers said they didn't purify it so im not sure how it works in less than spring water but i bring it whenever i go backpacking. It is nice that if it goes below freezing. I don't have to worry about a filter freezing and cracking and it is lighter than my old filter. Cautions not listed or explained in the instruction booklet. When you dip your Nalgene bottle into the source water, the threads get contaminated and therefore the cap gets contaminated too, when you put the cap back on. Any spillage over the top, or water droplets above the water line in the container are suspect contamination. Micropur (and other products too) recommend after dissolving their product in the water, that you crack open the bottle while holding it upside-down and let a bit of water flow out of the cap. The activated cleaning solution then cleans the cap and threads on the outside where you put your lips. All the water inside the container is cleaned too, not just the water below the water line. Caution: You can not clean the cap and threads or water droplets above the waterline with the SteriPEN product. This thing is like something out of science fiction! This thing is like something out of science fiction! Granted I'm not doing long haul hiking through a Guatemalan jungle. My outdoors adventure mostly consist of weekend to four day camping in the Hoosier National Forest and other mid west venues. I hike with a pair of ancient dogs that are fine drinking out of creeks and ponds when they’re available. The problem is we like to camp near hill tops where there isn’t much water and we’re all thirsty at day’s end. 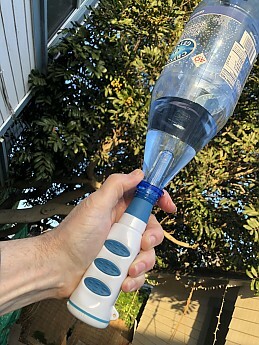 With this thing I can refill my 2 quart army surplus canteens during the day’s hiking (using the funnel/filter gizmo to remove any solids) and then nuke any micro critters with the UV rays from the SteriPen. One push of the button clears an entire 32 ounce canteen. I admit I’ve only had limited experience with a fellow hikers pump type filter, and that seemed like a lot of work! The purification tablets work okay (and I still carry them for back up) but the water tastes nasty! I made sure to read the instructions for the SteriPen so I knew to use name brand lithium ion batteries. I’ve had the thing several months now and am still on the first set. I did read one negative review of this product. I’ve got to think that particular user cut corners and used the alkaline batteries, which the manufacturer warns only last about 40 zaps. (The guy’s gripe was that the batteries went dead after only a few uses.) The lithium ones purport to be good for several hundred zaps, and I’m beginning to believe it. The pump filters I’d looked at weren’t that much cheaper than the SteriPen, but much bulkier. Doing a little math it looks like the long term expense of changing batteries isn’t too far off from what I’d spend on filter cartridges and such. I admit you do need to either carry back up batteries or be close enough to civilization that you can get more. But as I said at the outset, I’m a Midwest hiker so that’s not a problem. You folks heading up the Amazon may want to stick to your manual filters, and carry purification tablets as back up. But hey, that’s what I do here in Indiana, too! The SteriPen was a huge waste of money. I took it on a three day pack trip as my only form of water purification (bad idea). It seemed to work fine at home with fresh batteries. Used it once on the trail with no problem. After that it never worked correctly again. It would only stay on for about two seconds and shut itself off. The directions say it's because of low batteries. After new batteries it did the same thing. Tried everything possible to get it to work but nothing helped. Luckily a fellow packer had a pump filter. I will stick with the pump filter from now on. I recently use this product in a trip in South America. I have to say that it is top notch. I had a few issues getting use to using it during the first treatments, was a little confusing first but after reading the instructions again every thing went fine. This is way easier that a filter, pumps or messy chemicals. I recommend this product 100%. 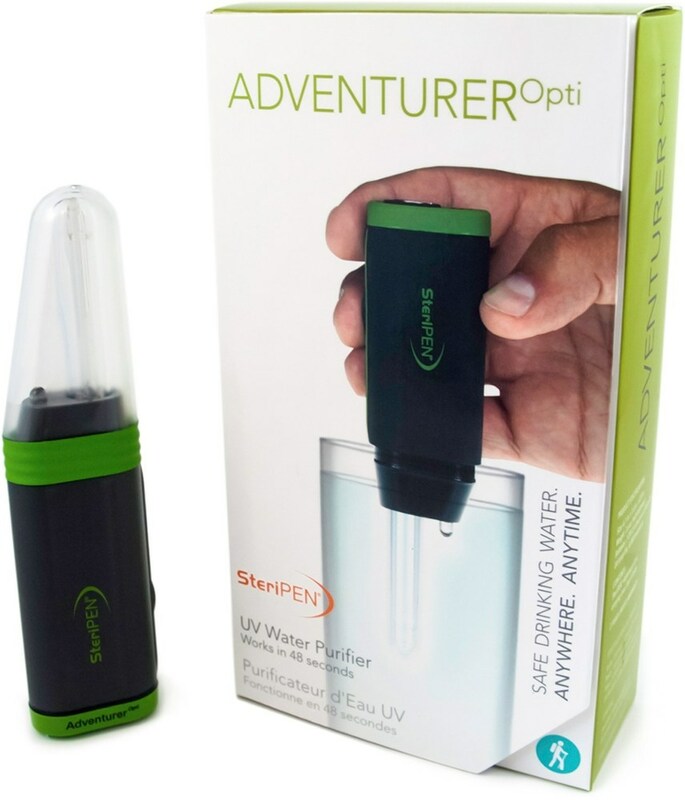 Overall, the SteriPen is perhaps the best idea I have come across in the outdoor industry with regards to water purification. I have used pumps, pills, boiling and this is the most efficient. I previously used an MSR MiniWorks pump filter and I could never get the thing to work quite right, even after I had sent it back to MSR for repairs. 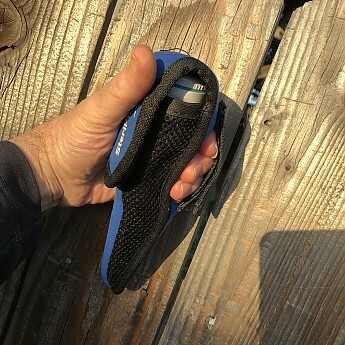 I will echo what most of the users have said about the benefits of the SteriPen in that it is light, fast, packable and very easy to use and does kill everything in the water. 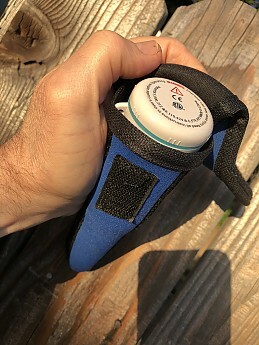 After using it on a 4 day backpacking trip to Cold Mountain, I was impressed at how easy it was to use when I had access to a deeper body of water. Two problems that I encountered: I was not aware that the SteriPen had a compatible Pre-Filter that screwed onto the top of a nalgene so I was forced to use two water bottles, one for dunking into the stream and the other to hold the purified water. I have since purchased the filter so that problem has been rectified. The largest problem that I had was that if I could not fit my water bottle into the water source, I was outta luck. Luckily, some folks on my trip had a pump filter and the hose could fit into the little nooks and crannies and extract water. There are obviously ways in which to pool water but when it's freezing outside, that last thing I want to be doing is dipping my hands into frigid streams. 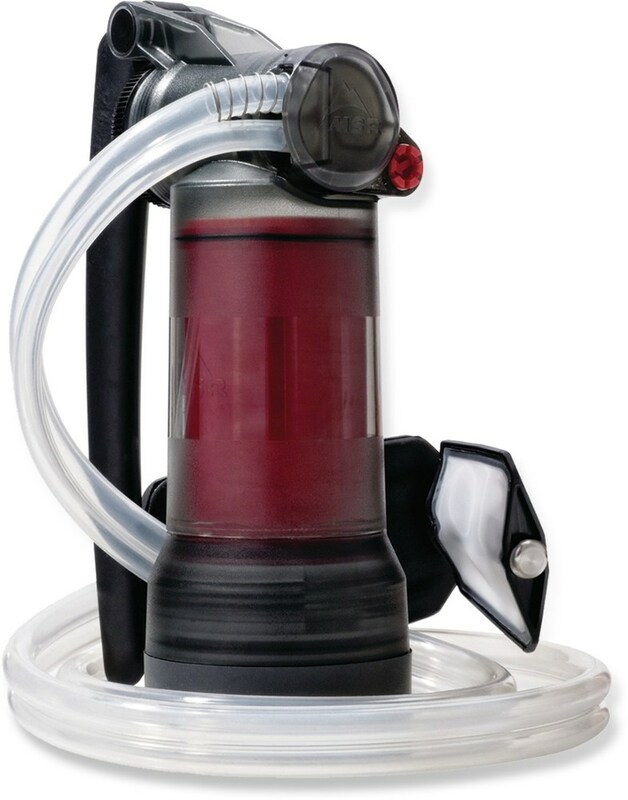 I wrote SteriPen an email asking if they had designed a simple pump system that would be compatible with either the Pre-Filter or a nalgene and they never replied. I wish I could say that I don't see this as being a big issue, but I do believe that I will be backpacking in areas of drought or places with hard to reach water and a simple and small yet effective pump system could totally complete the SteriPen system. As for now, I have jerry rigged my MSR mini works to screw onto the top of the Pre-Filter just in case. Overall, an excellent system and a great purchase! Drank from sources I would classify as "questionable" and never had "a bad experience". 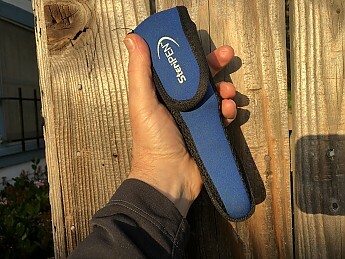 This has been a companion of mine not only on overnight trips but also on day hikes and remote mountain bike excursions, so I don't have to carry as much water up the hill. The prefilter is a good investment, as using a bandana to filter out sediments can be frustrating. I was skeptical at first that the little light was going to do the job but now I am a believer. Small, light, no pumping, must have!! Price Paid: 120 bucks or so.. I have used it extensively in Central America and have never been sick. It does drain batteries quickly (they disclose this though) and it does not replace a filter so beware if you lack a generally particle-free source. I used the 2006 version of SteriPen (more expensive than the end-2006 version, but both rated to work the same) for two months in Nepal in fall 2006, and it worked faultlessly for the whole period -- about 200 liters for myself, and a couple other people for the first few weeks. With rechargeable NiMH batteries I purified between 50 and 60 liters per charge (of four AA batteries). Unlike other reviewers, I found no problem with the unit at low temperatures; it worked fine -- again, with NiMH batteries -- at well below freezing. I have trekked in Nepal before and was elated this time not to have to use iodine or chlorine or other chemicals that make water taste bad. The SteriPen is far more convenient than pump filters I have used, especially when the pump filters clog and need to be cleaned. Online research showed me that independent testing by the University of Michigan showed SteriPen to be fully effective in killing everything -- including viruses -- in 60 seconds, yet the unit is set for 90 seconds (for treating a full liter). I share the same thoughts as far as pros go as the other reviewers, with a special affinity towards the ease of use part. The big problem we had is when it got cold, it stopped working. The solution was to sleep with the batteries in my pocket and it worked when the tempature was below freezing. Pro: 1. The technology kills EVERYTHING that might be in the water (bacteria, viruses, protozoa...) unlike a lot of other purification systems. 2. No chemicals, no change in taste, no long waits (treating 32 oz of water takes about 90 secs and you can drink it right away). Con: 1. The lamp is fragile so don't drop it when the plastic cover is off, better yet don't drop it at all. 2. Not really a con, but make sure you get it with the pre-filter, not only will that remove any particles in the water but it also ensures a perfect fit between the steripen and your bottle so you won't spill water or have to perform acrobatics to treat water in a wide-mouth (eg Nalgene) bottle. Tip: Use it with Ni-MH batteries as you can recharge those and they last a long time (about 50 32-oz treatments). This is a great water purification device for backpacking- or any other outdoors activity where you want fresh clean drinking water. First some of the cons... you need enough water that you can totally submerge a nalgene- no pump. This has only been an issue once or twice and someone in my group had a pump- and I had enough water anyways. Pros- light weight- EASY- FUN- kills everything, even viruses. I like it over filter pump devices because I know it's killing the rare virus, and doesn't have that after taste from pills etc. Considerations- you can't use alkaline batteries. LET ME REPEAT! You can't use alkaline batteries! You must use rechargeable or NiCad's. I use rechargeable as they are the most reliable. READ the instructions and don't guess your way through it on the first time and you'll love this thing.